Ryan Kraft, and Rajiv Asthana, University of Wisconsin-Stout Objective and Significance Experimental Procedure Our research investigates how the process of brazing modifies the original braze composition and braze metallurgy in the vicinity of joined interfaces and how braze alloys modulate the structure, composition and metallurgical adhesion to substrates. Developing and demonstrating methods to braze high-temperature alloys are the practical goals of our broader research effort. Cut Inconel on high-speed precision saw, lay braze foil at mating surface, apply a load ( N) during brazing. Heat under vacuum (~10-6 torr) to 15-20C above braze TL. After 5 (or 30) min. soak, slowly cool. Heat treat joints in air at two-thirds of absolute braze melting temperature for 45 min. completed at UW-Stout. Mount joints in epoxy, grind, polish and examine joint microstructure using optical microscopy (OM) and scanning electron microscopy. Measure Knoop hardness (Buehler Micromet 2001 Unit, 100 g load, 10 s). Inconel/Inconel Joint with MBF-30 Braze (R2, 1045 C, 5 min) The microstructure of the Inconel MBF-20 braze joint show many layers within the reaction layer, similar to that of MFB-30. The hardness of the braze was lower than that of the substrate’s. Background Inconel 625 (melting point: 1350°C) is a general purpose nickel-chromium- molybdenum alloy in the family of Inconel alloys that were developed for elevated temperature use. Inconel 625 has good corrosion and oxidation resistance which makes it suitable for harsh environment applications. Inconel alloys are used in a wide variety of applications, from gas turbine blades and heat exchangers to NASCAR exhaust systems and X-15 rocket planes. In applications, Inconel must be joined to itself or to other alloys to make complex assemblies . KHN = 252 KHN = 415 Joint Microstructure vs. Knoop Hardness Profile 100 μm KHN = 278 Composition and Properties of Brazes Inconel/Inconel Joint with Ticusil Braze (R19, 920 C, 5 min) Braze Comp., % TL, K TS, K E, GPa YS, MPa CTE, x10-6 K-1 K, W/m.K %El MBF-30[b] Ni-4.61Si-2.8B-0.02Fe-0.02Co 1257 1327 -- MBF-20[b] Ni-6.48Cr-3.13Fe-4.38Si-3.13B 1242 1297 TiCuSil[a] 68.8Ag-26.7Cu-4.5Ti 1173 1053 85 292 18.5 219 28 Cusil-ABA[a] 63Ag-35.3Cu-1.75Ti 1088 83 271 180 42 Reaction Layer It appears that the microstructure of the Ticusil/Inconel interface contains a reaction layer extending from the brazed region into the Inconel substrate along the Inconel’s grain boundaries. The reaction layer was much harder than the braze region or Inconel substrate. KHN = 335 Inconel Braze KHN = 121 l KHN = 660 100 μm [a]Morgan Advanced Ceramics, [b]Honeywell, Inc., TL: liquidus temperature, TS: solidus temperature, E: Young’s modulus, YS: yield strength, CTE: coefficient of thermal expansion, K: thermal conductivity, El: percent elongation. 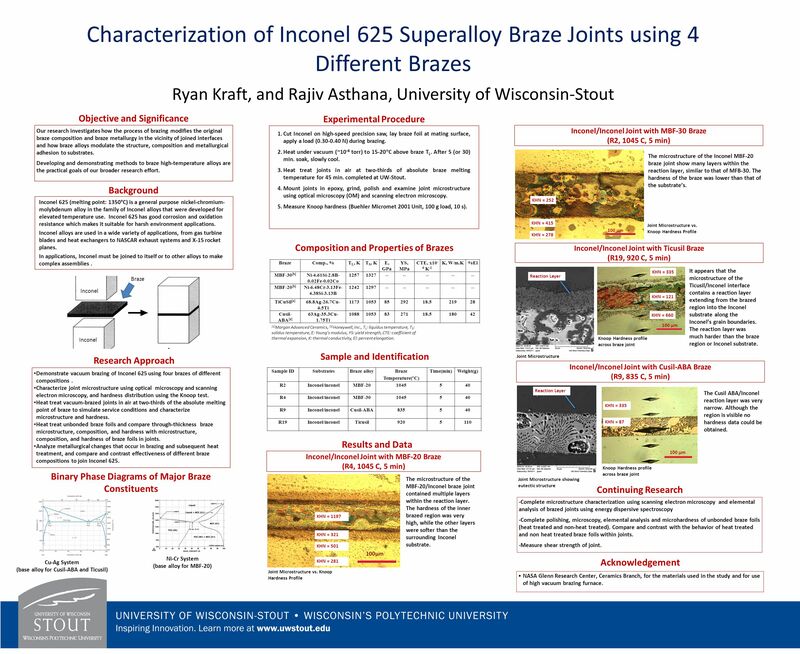 Knoop Hardness profile across braze joint Sample and Identification Research Approach Joint Microstructure Inconel/Inconel Joint with Cusil-ABA Braze (R9, 835 C, 5 min) Demonstrate vacuum brazing of Inconel 625 using four brazes of different compositions . Characterize joint microstructure using optical microscopy and scanning electron microscopy, and hardness distribution using the Knoop test. Heat treat vacuum-brazed joints in air at two-thirds of the absolute melting point of braze to simulate service conditions and characterize microstructure and hardness. Heat treat unbonded braze foils and compare through-thickness braze microstructure, composition, and hardness with microstructure, composition, and hardness of braze foils in joints. Analyze metallurgical changes that occur in brazing and subsequent heat treatment, and compare and contrast effectiveness of different braze compositions to join Inconel 625. Sample ID Substrates Braze alloy Braze Temperature(°C) Time(min) Weight(g) R2 Inconel/inconel MBF-20 1045 5 40 R4 MBF-30 R9 Cusil-ABA 835 R19 Ticusil 920 110 Reaction Layer 100 μm KHN = 335 KHN = 87 The Cusil ABA/Inconel reaction layer was very narrow. Although the region is visible no hardness data could be obtained. Results and Data Inconel/Inconel Joint with MBF-20 Braze (R4, 1045 C, 5 min) Knoop Hardness profile across braze joint Binary Phase Diagrams of Major Braze Constituents 100μm KHN = 281 KHN = 321 KHN = 1197 KHN = 501 The microstructure of the MBF-20/Inconel braze joint contained multiple layers within the reaction layer. The hardness of the inner brazed region was very high, while the other layers were softer than the surrounding Inconel substrate. Joint Microstructure showing eutectic structure Continuing Research Complete microstructure characterization using scanning electron microscopy and elemental analysis of brazed joints using energy dispersive spectroscopy Complete polishing, microscopy, elemental analysis and microhardness of unbonded braze foils (heat treated and non-heat treated). Compare and contrast with the behavior of heat treated and non heat treated braze foils within joints. Measure shear strength of joint. Cu-Ag System (base alloy for Cusil-ABA and Ticusil) Acknowledgement Ni-Cr System (base alloy for MBF-20) Joint Microstructure vs. Knoop Hardness Profile NASA Glenn Research Center, Ceramics Branch, for the materials used in the study and for use of high vacuum brazing furnace. Download ppt "Ryan Kraft, and Rajiv Asthana, University of Wisconsin-Stout"
These aren’t really ‘properties’ – more like definitions that relate to what’s happening microscopically. The goal here is to relate structure to properties. On Pb-free (solder) Interconnections for High-Temperature Applications A.A. Kodentsov Laboratory of Materials and Interface Chemistry, Eindhoven University. Non-Arc Welding Processes Resistive heating, chemical reactions, focused light and electrons, sound waves, and friction can also be used to join materials. PART 2 : HEAT TREATMENT. ALLOY SYSTEMS STEELS ALUMINUM ALLOYS TITANIUM ALLOYS NICKEL BASE SUPERALLOYS. Be/FS joining for ITER TBM Ryan Matthew Hunt FNST Meeting August 18, 2009 A collaboration between UCLA, SNL-Livermore, Brush-Wellman, Axsys Inc. and Bodycote. The development of brazing technology for SiC/SiCf composites for the fusion reactor applications Collaboration: ENEA Frascati, Italy Max Planck Institute. Powder Production through Atomization & Chemical Reactions N. Ashgriz Centre for Advanced Coating Technologies Department of Mechanical & Industrial Engineering. O AK R IDGE N ATIONAL L ABORATORY U. S. D EPARTMENT OF E NERGY Lara-Curzio et al. IGTI Page 1 of 45 Screening and Evaluation of Materials for Advanced. Catalysts in SOFC Use of Raney Nickel in Infiltration at Anode Advisors: Professors Trumble and Slamovich. Oxidation behavior of RuAl alloys Manuel Acosta MSE/REU 2004 Adv. Dr. David R. Johnson August 5, 2004. Influence of thermal cycling on shear strength of Cu – Sn3.5AgIn – Cu joints with various content of indium Pavol Šebo a, Peter Švec b, Dušan Janičkovič. Solidification of Pb-Sn Alloys Teri Mosher University of Illinois Advisor: Professor Krane. Phase Diagrams Chapter 9 4 th Edition Chapter 10 5 th Edition.